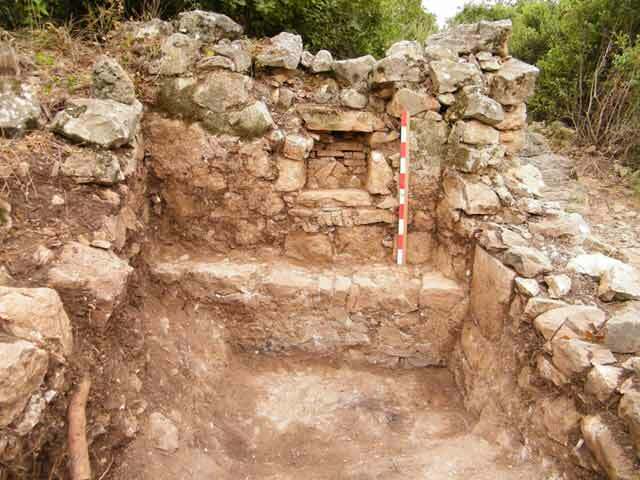 During April, 2012, the second four-week season of excavations was conducted at the Montfort Castle (License No. G-21/2012; map ref. 2217/7724; National Parks Authority Permit 2791/12). 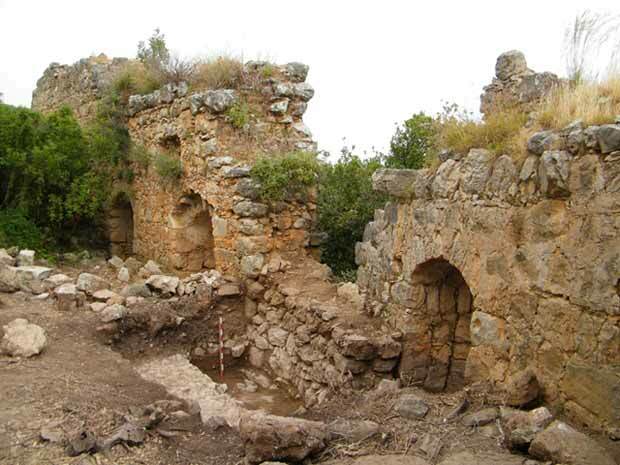 The excavation, on behalf of Haifa University, the Zinman Institute of Archaeology, and the Society for the Study of the Crusades and the Latin East, was directed by A.J. Boas (field photography), with the assistance of R. Khamisy (field photography) and R. Lewis, R. Kool (numismatics), as well as students and local volunteers. One of the Montfort Castle Project aims is to carry out a detailed examination of the castle’s forewall, which extends from the keep down the north slope and around the northern and western sides of the castle (Fig. 1). This wall, which appears to have been constructed in stages (Fig. 2) and which is in places preserved to its full original height, has only been cursorily examined in the past and has never been excavated. In addition, it is our intention to examine and excavate a series of rooms adjacent to the forewall. These rooms were built against the forewall and sections of their interior walls can been seen at the western extension of the castle. The rooms were apparently roofed with wooden beams supported on brackets and putlog holes that can be observed along the interior of the wall (Fig. 3). These rooms constituted an outer ward of the castle. (1) To expose and attempt to identify the function of the rooms located here. (2) To examine a point where two sections of the forewall join—one, turning east (W1) being preserved to its full height including crenellation, and the other, continuing south (W2), being considerably higher (at least 5 m higher than W1), broader and better constructed. At the point where these two sections join, the inner face of W1 meets the outer face of W2. Various attempts to explain this anomaly included such ideas as slipping of the walls on the steep decline due to tectonic activity or damage caused during the sieges. A probe and two squares were opened. The probe was dug against W2 at the second archery embrasure (E4). The embrasure was entirely cleared and examined and a small section of the fill to its east was cleared. A plaster floor could be seen to have been cut through, apparently in order to construct the wall, i.e., the floor was earlier than W2, and apparently had originally extended beyond its inner face. A square (B2) was opened against the interior face of W1 and W2 at the point where they meet, extending north as far as the second embrasure in W1 (E2). The square originally was marked to extend into the interior as far as the interior wall of the chambers (W4). However, only a part of this square adjacent to the walls was excavated. Almost immediately, a massive but roughly built wall (W3) was uncovered, attached to the end of W2 and the adjoining inner face of W1. 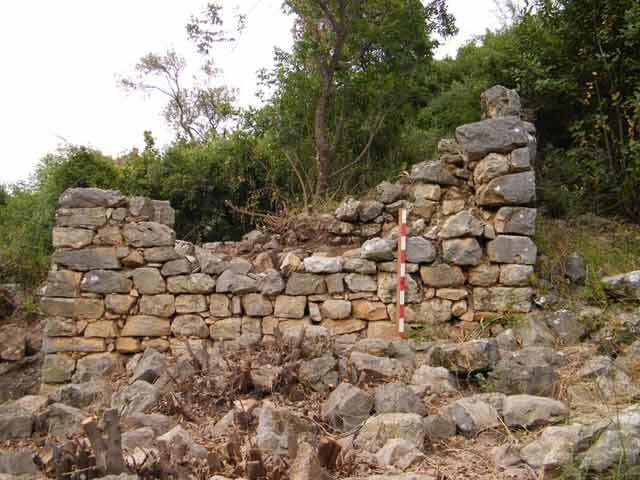 Clearly, this wall had been constructed to join the two sections of the forewall, perhaps a temporary measure as its construction was not of the same quality as that of those walls. The upper fill included Roman and Crusader period ceramics. At a depth of c. 0.5–0.7 m a stone floor (L009) was exposed; it consisted of two layers of small closely packed fieldstones (Fig. 4). This floor abutted W3 and must have been set immediately or very shortly after it had been built. The fill directly above Floor 009 contained burnt beams and arrowheads. Consequently, we concluded that the fill on this floor dated to the destruction of the castle in July 1271 CE. Some thirteenth century CE pottery was found, as well as a large number of construction and horseshoe nails, and two coins: one of Hugh IV of Burgundy (1218–1253 CE) and the other of Conradin, King of Sicily (1254–1258 CE). 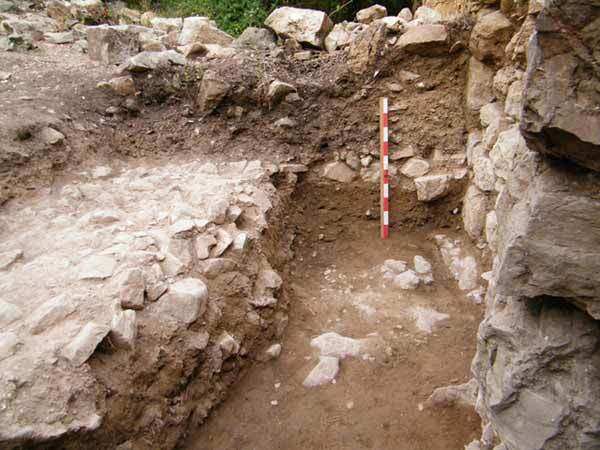 A section of Floor 009 (width c. 1.5 m) along the length of the square from W2 to E2 was dismantled and the excavation continued until, at a depth of c. 0.4 m below the floor, a second packed white plaster floor (L011) was reached. In the process, E2 was entirely exposed. This floor was in fragmentary condition but could be clearly observed as predating W3. It is apparently the same floor, or at least of the same date, as the floor found in the probe against E4. The two coins found in the sealed fill above Floor 011, one from Chartres, of Theobald VI (1205–1218 CE) and another of Henry I of Cyprus (1218–1253 CE), but most likely after the reform of 1230 CE, did not greatly refine the dating of the upper Floor 009 which apparently was not installed before 1230 CE, but that is only a few years after the first construction at the castle, c. 1226 CE. Additional thirteenth century pottery was found on Floor 009, as well as nails, and many bones, several of which appear to be cattle bones, but scattered and probably the remains of meals. Analysis of the architectural finds has led us to the following scenario. Wall 1 is the earlier of the two fortification walls. The plaster floor belongs to this early phase. It would appear that at some stage, for reasons unknown but probably due to a partial collapse of this wall, a new wall, W2, was constructed. As noted, this was a better wall, more massive, considerably taller and better constructed. Apparently, it was for this reason that it could not be built on the same line as the older wall. The ground slopes steeply to the west and the walls were constructed on stepped bedrock. The builders therefore chose to construct it a few meters east of the former line and for that purpose, they cut a foundation trench through the existing floor. After its construction, they raised the floor levels and presumably reconstructed the rooms adjacent to the wall. At the point where the old wall was still standing, they patched the breach or weak point of the join with a roughly built wall, W3. Possibly this was a temporary measure and perhaps the intention was to replace the continuation of W1 with the new wall, but if so this was not carried out by the time of the castle’s fall. 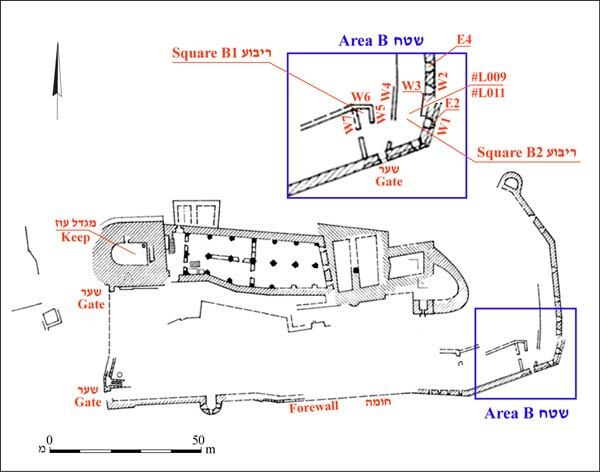 Another square (B1) was opened within a small room or booth located directly opposite the gate on W1 (Fig. 5). This booth (W5–W7), possibly a guardhouse for the gate, was partially cleared down to its floor, above which were signs of conflagration. The material finds were similar to those in the other square, namely pottery fragments, nails and some animal bones. A small square niche in the southern wall (W6) and a raised step (Fig. 6) are at the back of the booth. Dean B. 1927. 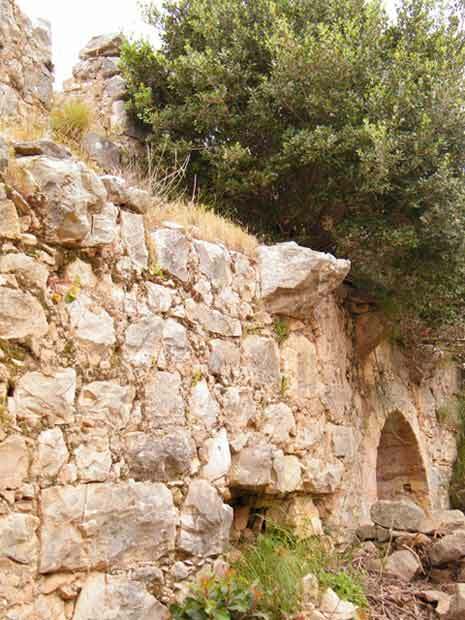 The Exploation of a Crusader’s Fortress (Monfort) in Palestine. Metropolitan Museum of Art Bulletin 22:5–46. Frankel R. 1993. Monfort. NEAEHL 3. Pp. 1070–1073. Hubatsch W. 1966. Monfort und die Bildung des Deutschordensstaates im Heilen Lande. Nachrichten der Akademie der Wissenschaftten in Göttingen 1, Philosophische- Historische Klasse 5, pp. 159–199. Pringle R.D. 1997. Secular Buildings in the Crusader Kingdom of Jerusalem. Cambridge. 1. General plan showing excavation area (after Dean 1927; Hubatsch 1966; Frankel 1993; and Pringle 1997:75). 2. Square B2, Walls W1, W2 and W3, looking southwest. 3. Brackets for the roofing beams. 4. Stone Floor 009 against W3 with probe trench down to earlier Floor 011, looking south. 5. Guard booth, looking east. 6. Interior of guard booth, looking south.